Danny Wallace spent the second half of last season on loan at Carrick Rangers. Picture: Press Eye. 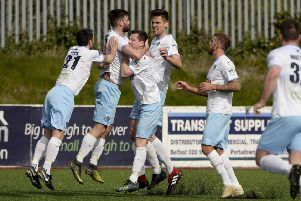 David Jeffrey has made his ninth summer signing at Ballymena United by snapping up Linfield youngster Danny Wallace on loan. The 21-year-old left-back joins on a season long loan after spending the second half of the previous campaign on loan at Carrick Rangers. “Daniel joined the club on the strong recommendation of (chief scout) Paul McAreavey who knows him well from when he managed him at Donegal Celtic, and latterly he and Pat McShane brought him to Linfield,” explained Jeffrey. “He’s naturally a left back and in bringing Daniel here it strengthens the squad in that position. “When we spoke to Daniel, as with all players, we went through the same interview process and he bought into our vision and agreed to come. “He wants to get games and here he will get that opportunity although, as with every player, he’s only guaranteed that should he work hard and merit a place in this team. “One of the most important aspects of all our signings to date is that we are creating competition for places in the starting eleven and signing someone of Daniel’s talent is another piece in the jigsaw in that respect. “Several clubs have tried to get Daniel on loan, and when we approached Linfield it was clear that there was no pressure on him for whom he should sign. “We are extremely appreciative to David Healy and Linfield for allowing him to go out on loan and entrusting us to look after his development as a top flight player. “In return we will benefit from having a young energetic man who is hungry to prove himself week in, week out at the highest level,” aded Jeffrey. Meanwhile, United continue their pre-season preparations tomorrow when they will again split their squad to play two friendlies in close proximity to each other as two different panels travel for fixtures at Championship sides Knockbreda and Harland and Wolff Welders. Both games kick off at 3pm.